Better late than never for Tell Me Thursday right? I live in a town that is an hour's drive from Boston, so far that a primary source of entertainment is youth soccer. Little league is pretty big too, with basketball and hockey trailing behind with multi-town leagues. But our little town hosts a soccer tournament on Columbus Day weekend where teams from across the state as well as New Hampshire come to play. Big time right? We have been involved in soccer for four years now in various roles as team parent and assistant coach, but not as over the top crazy volunteers. Last year, Adam was allowed to play in the boy's U10 (under 10) travel league even though he was seven, and he did quite well. 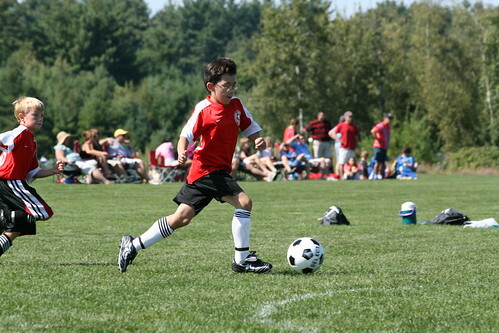 For this season, he officially tried out for the U10 league and was placed on the B team. B team? My soccer star? What's going on here? Admittedly, he was off on the call back try-outs as it was raining (can't see through his glasses). But all the coaches and players already know and fear him. We were not going to make a stink about it. I started to think that maybe all the players on the A team were already nine years old and in fourth grade, but later I found one 3rd grader made the cut (admittedly he is very good, but some of the older kids are not). Was it just town politics? Over Labor Day weekend, there was a tournament where he played with the A team. In one game, he scored two out of the six goals and in another he scored one of the two goals. Obviously no slouch for a B team player and he clicked right in with the other players. Everyone was at the right place at the right time and it was a beautiful thing to watch. But I guess the B team can have a star player as well. On his first regular game with the B team, it poured and he scored the team's only goal despite his spotty glasses. The team was not cohesive and got trounced 10-1. Hopefully they'll get it together and support their star player. No sour grapes here... ARGHHHH!!! This photograph was shot during the Labor Day tournament. His goofy left leg just happened to be flapping sideways after landing on his right kicking leg. 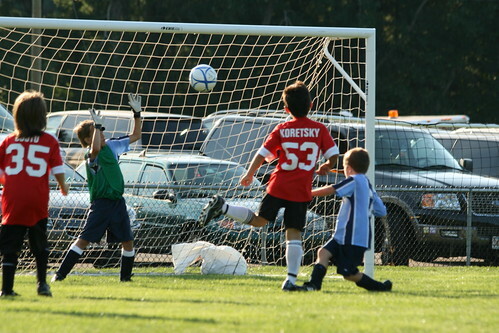 I just love the position of the ball perfectly shot into the goal.